Most countries have a sweet treat or delicacy that appears only for the holiday season. In France, at least in our region there is a surprising array of beautifully packaged, jarred, boxed or wrapped luxury savory foods like foie gras and pâté. And although our regular cheese selection is bountiful, at Christmas time, the frommageries burst with beautiful, tiny cheeses for entertaining, making hampers and giving as gifts. These are glorious little artisanal creations that fit in the palm of your hand, sometimes covered in dried flower petals or finely diced dried fruit. In Greece, at Christmas time, that perfect little holiday season morsel is known as the Kourabie, pronounced: kou-ra-be-eh. 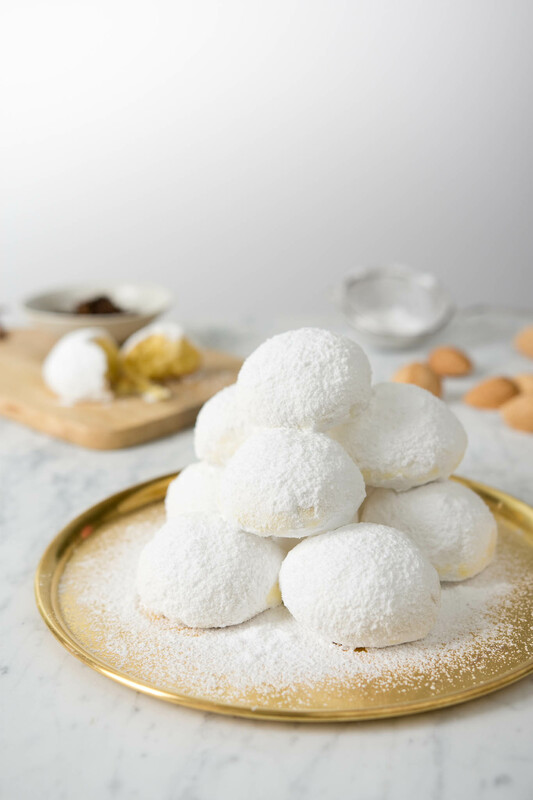 Kourabiethes (plural) are light, delectable shortbread-like biscuits covered in confectioner’s sugar, sold by weight and made in Greek kitchens all over the world. Like all traditional recipes, they vary slightly in texture and flavour with some Greek cooks using different butters depending on their region, including but not limited to buffalo milk butter, goat milk butter, sheep milk butter or regular cow’s milk butter. Some also use finely sliced and roasted almonds for texture and some add a splash of scotch whiskey for aroma. But the key to the perfect Kourabie is using a high quality butter and beating it, very very well. This produces a very light, melt-in-your-mouth biscuit. If you are new to kourabiethes, there are a few things that I can tell you that will aid you in experimentation and personalisation. 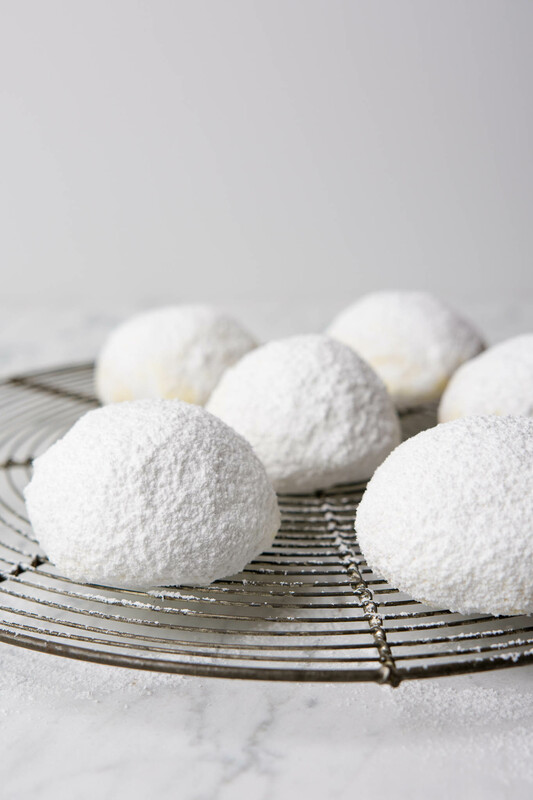 To assist the sugar in sticking, each kourabie is lightly sprayed or brushed with water and then rolled in and covered with confectioner’s sugar. After a short while, the sugar soaks in the water creating a fine icing shell in-between the biscuit and the fluffy sugar outer. This shell not only creates a light structure for the delicate biscuits but also, I believe, increases its shelf-life. To make the ingredients easier to procure, I have specified water but I myself and many Greek cooks use rose water or orange blossom water to add a fresh Eastern flavour. There’s plenty of room for personalisation here. 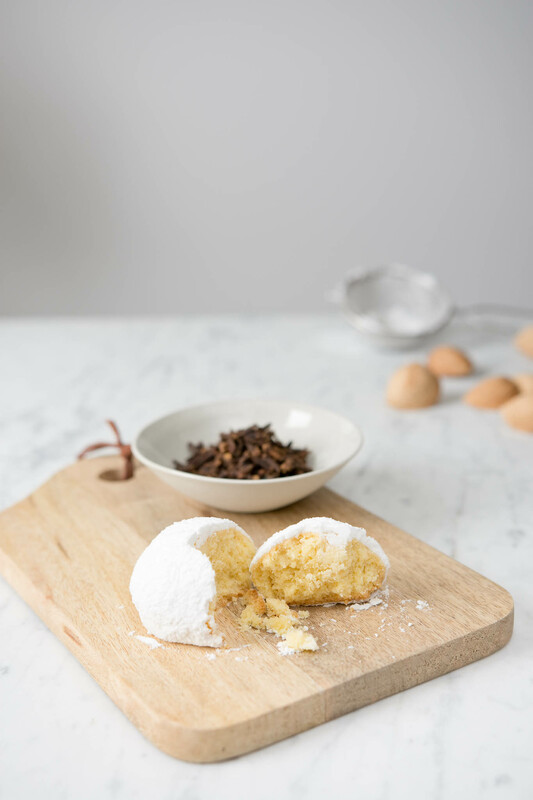 One could experiment with flavour-filled infusions in place of the rose water or spice the confectioner’s sugar by adding crushed clove or cinnamon. In Greece, kourabiethes are usually found either shaped as a ball or a crescent moon. I find the ball to be less fuss and much faster to form. Due to the high butter content, it is imperative to work as quickly as possible to ensure that the butter doesn’t melt. Any novice would be forgiven for thinking that the little powdery snowballs are sturdy, they certainly feel it in the hand, but they crumble at the slightest amount of pressure. So, a single bite size is good for most. Especially children. The biscuits in the photographs are four-bite size. If your room is warm, you can rest your bowl in a cold bain-marie to keep the dough cool. I myself keep the baking tray away from warm appliances, i.e. the cooking range, before preparing the biscuits and while laying them out for baking. Store the kourabiethes as you would loukoumi (turkish delight), buried in confectioner’s sugar. They are fabulous gifts for «drop by for tea» invitations and fun to box, wrap and package. 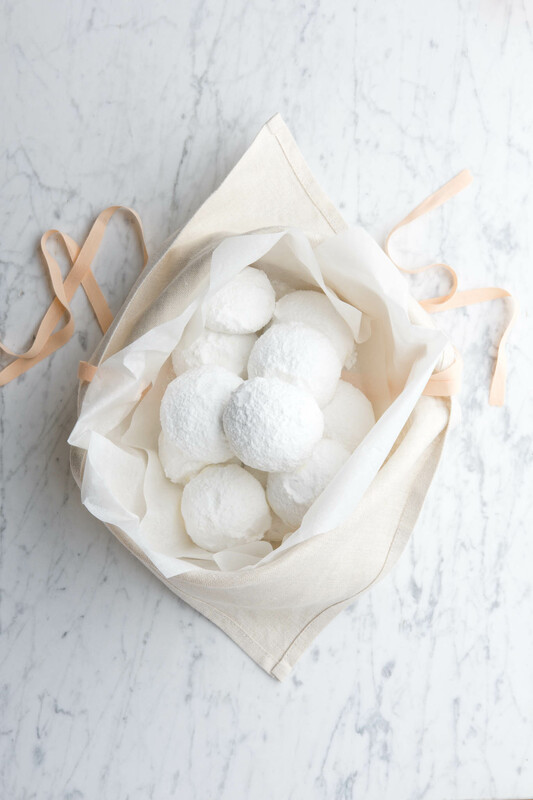 ¼ cup confectioner’s sugar + 3-4 cups for dusting and storing. In a medium to large mixing bowl, place the room temperature butter, egg yolks, ¼ cup of sifted confectioners sugar and sifted baking soda. This will be referred to as the butter mix. Into a second bowl, sift flour, almond meal and salt. When you get to the larger pieces of almond meal, you can break them up and tip them into the mix. This will be referred to as the flour mix. Prepare an un-greased cookie sheet and cover it with a sheet of baking paper. Using an electric mixer set on medium speed, beat the butter mix until smooth and creamy. I know that it is ready when it is light in color and has lines and ripples in the surface. It can take up to 20 minutes to achieve this. Do not hurry this key step. With the electric mixer set on low speed, slowly add the flour mix at a rate of ¼ cup at a time, until beaten in. Once all of the ingredients have been incorporated, if you find the dough to be too sticky to handle, you can sift in small amounts of flour until it is no longer so. Take small pieces of dough, the size of an un-shelled walnut, and shape into a ball. Place on the baking-paper-covered cookie sheet 1 to 2 inches apart. They will not spread much. Bake for 18-20 minutes but keep an eye on them. You want them to have a light golden color, not a golden brown color which would indicate they dried out too much. I advise a single-biscuit test to evaluate best cooking time. Once baked, slide the baking paper from the baking tray onto another cool tray, being very gentle in your movements. While the butter is hot the biscuits are extremely delicate. Let them cool completely before the final step. Take a baking pan, large enough to fit all of your kourabiethes, and cover the bottom in a generous layer of confectioner’s sugar. You want to ensure that you cannot see the bottom of the pan through the sugar. Once the biscuits are completely cool, using a spray atomizer or brush, lightly and evenly coat a single biscuit with the coating water you chose. If dripping, gently dry off with a paper towel. Place the biscuit on the sugar coated tray and generously sift confectioners sugar over the damp biscuit ensuring that it is completely covered. It can build up on the sides. Repeat one biscuit at a time until they are all sugar coated. You can store the biscuits in this pan until ready to serve. We often eat them straight out of the storage tray but if I plan to present them to guests or give them as a gift, I do as follows. I take each kourabie out of the storage pan and gently dust them off to reveal the round shape. With a small strainer or a sifter I sprinkle it with fresh sugar while balancing it in my hand. Finally, I dust a little more sugar once on the serving plate. Photo 4: CROP linen Azuma in Natural colour. These look and sound so delicious! Look fabulous – must try! All content on this site is Copyright © 2016 Kathryn Sanderson. All rights reserved.